Black leather belt. The buckle features the Floris van Bommel logo. Black leather belt. 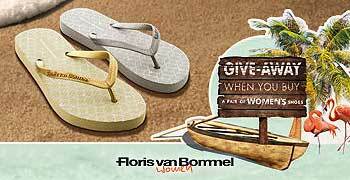 The buckle features the Floris van Bommel logo. Underneath the buckle a metal tag with the Van Bommel logo has been attached. The belt width is 4,5cm. The belt is the same colour and material as the matching shoes. 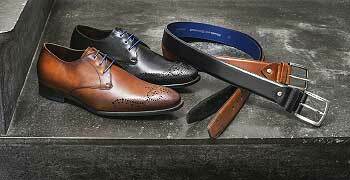 Details on the belt such as the grain, the structure of the leather and the finish methods used are identical to the shoes. The belt can be tailored exactly to size by hand. After unscrewing the fastening screw the belt can be cut exactly to size on the side of the buckle. To reposition the fastening screw, make a small hole on the end of the belt by hand. This ensures a correct position of the closing pin in the buckle: the middle of the five holes.